Amid an audience of hundreds of people, Priyanka Chopra arrived at the Siri Fort Auditorium to deliver her lecture for the 11th edition of the Annual Penguin Lecture, hosted by Penguin Random House India. She was welcomed with a thunderous round of applause and loud hooting. 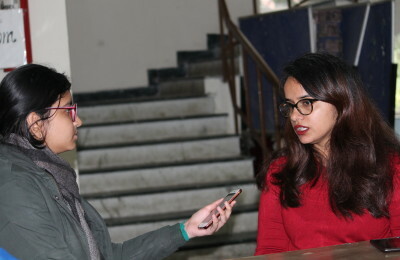 Ms. Chopra began her lecture by questioning the very definition of ‘breaking the glass ceiling’ and how it is a definition only directed towards women. She emphasised that she never wanted to break the glass ceiling but was only chasing her dreams. She also said that she wanted to become an engineer once, but her life took a different path and she never stopped setting more goals for herself henceforth. As was her topic, she made 12 points on ‘PC’s rules for becoming a better version of yourself’. Being fearless was the first point because often people do not chase their dreams out of fears. “You are never too old or too experienced to learn something new”, Ms. Chopra added. She went from wanting to become an aeronautical engineer to being an actor, singer, producer, and philanthropic by making right choices for herself. Making the right choices for oneself was her second point. “Opportunities are a funny thing. They don’t come very often. They come far and very few in between but our job is to recognise them and grab them”. The actor spoke of the opportunity when she was called to LA (to attend the Grammy Awards) a day after the premier of Don 2 at the Berlin Film Festival. Everybody around her discouraged from taking on this impossible journey but she charted out a plan for herself and accomplished it. “I want to have the whole cake and eat it too all by myself”, Priyanka said, and added that to achieve one’s dreams, one must be greedy and never compromise. “Don’t let anyone or any situation dictate to you who you are and who you can be”. Priyanka Chopra said that she puts in 200% into her work but once she fails, she gets up, dusts herself off and dives into life once again. She encouraged the audience to be bold and rake risks. She took major risks in her life by playing a negative role and women-centric roles early in her career, and even by taking up work in the US while at the top of her career in India. Each time the risks were career-ending but her gamble was worth it and invested with her heart and soul in her work. “No matter what you do, someone will always be unhappy”. She added that new age technology has given everyone the right to express their opinions by hiding behind the veil of anonymity but one must never listen to those voices. During the interview with Sonia Singh of NDTV, Priyanka Chopra opened up about being bullied during high school in the US. She was addressed as a ‘brownie’ because of her skin color. She revealed that she was thrown out of films in Bollywood because of the actor’s or director’s girlfriend but she never compromised with her position. Priyanka Chopra’s biggest dream is to leave a legacy behind. Ranked 97, she entered the Forbes’ list of the 100 most Powerful Women this year. On being asked about the Padmavati controversy, she commented that the entire crew has her support but questioned why only actors are asked for her opinions and not politicians. She put the speculations to rest that she hasn’t been chosen as the bridesmaid by Meghan Markel yet but she wishes happiness for the royal couple. Priyanka Chopra had to leave for Virat and Anushka’s reception in Mumbai, but before she left, the audience gave her a standing ovation and some even showered her with gifts like bouquets, paintings, and collages. Her lecture left the audience inspired to take on the world by being bold and fierce risk-takers. Previous PostPlay Review: Manto Ke Afsaane Next PostLife in a Metro...Literally!